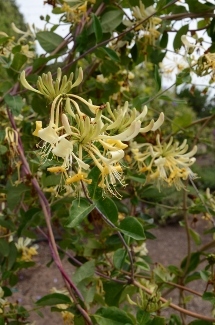 Joy Creek Photo Archive (c) all rights reserved Lonicera periclymenum 'Graham Thomas' is a vigorous deciduous vine with very fragrant, creamy white flowers that turn yellow as they age. The perfume lasts all day but is especially strong during the evening hours. July to September. 20 ft. In Northwest gardens Lonicera p. `Graham Thomas' seems to bloom better than other Lonicera periclymenum in situations with limited hours of mid day sun.